The question starts with how to find all the possible combinations for the elements in a given list. And I found the Python solution here. Of course, Python has already some built-in function to take care of it. 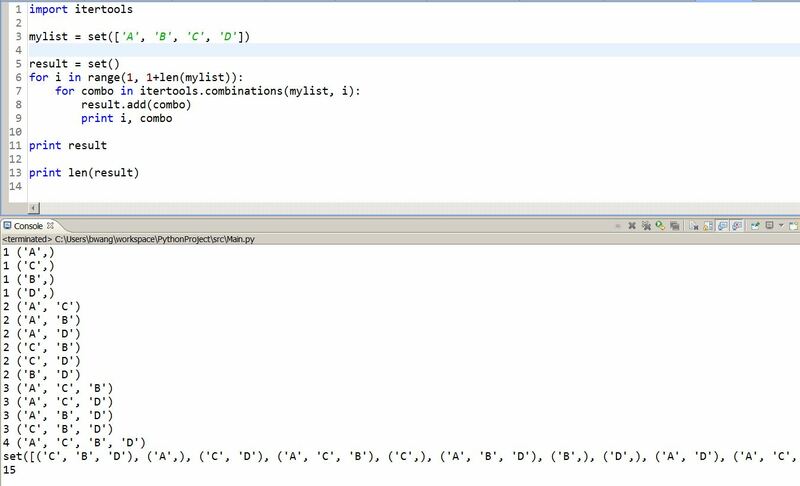 We have to use the combinations function from library itertools to do it. However, combinations function will only be a proxy as the C(3,n), so it will only return an interator with all the combinations that for a given length. To find all the combinations of the a set, we need to loop through all the possible length and add the possible combinations to the result. There are also a few interesting functions in itertools like permuations and group_by etc, which are all super useful.